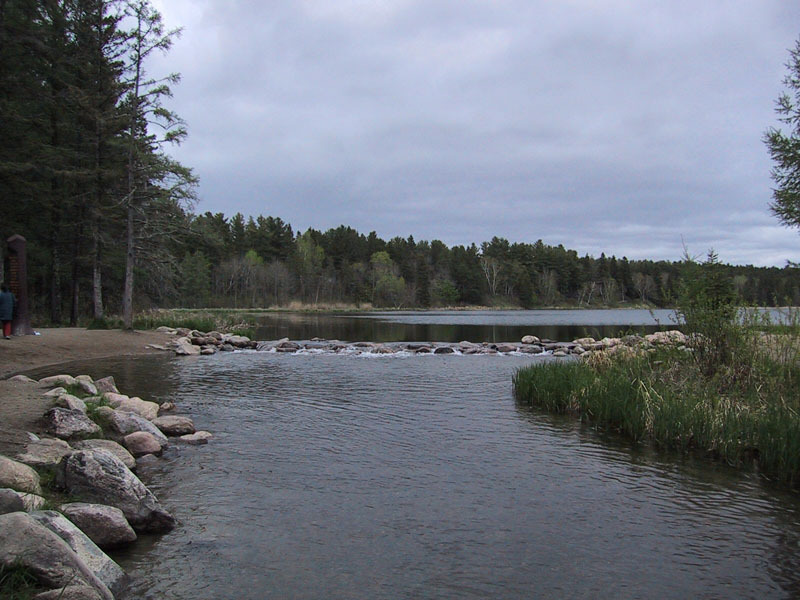 Lake Itasca, the source of the Mississippi River. The water is cool and clear. Many big stories take on a life of their own on the ‘net. The process works through and around the mainstream media where people are paid money for the purpose composing a story into useful information. Sometimes their sources are eyewitnesses or original documents found on the internet. But people often take off from the professionals, adding their own comments before sharing the story on social media. These might feed back to the mainstream eventually. Information strays away from the truth for many reasons once it leaves the primary source. 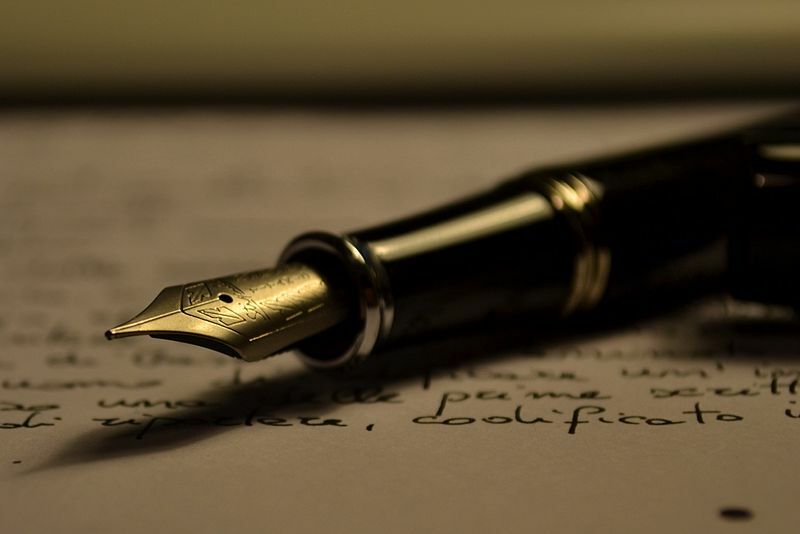 A professional writer may not have time or space to say everything they need to. People with one perspective may use what they find to push one part of their agenda, even as propaganda. Without the Urquelle it’s hard to tell just what potential problems there are. To use one example, the situation in Ukraine is an important story that has many people’s attention. But the Urquelle for much of the information is not originally in English and very far away from people in the US. That doesn’t stop people from offering their own comments and perspectives to secondary sources and hear-say despite some obvious difficulties. The flow of information from Ukraine quickly becomes as rolling and brown as the Dnieper River flowing past Kiev. The recent protests in Kiev. 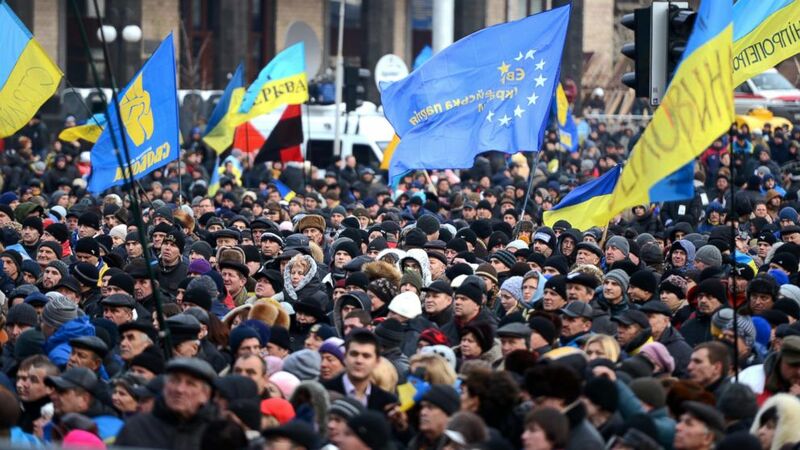 Note the blue and gold flag of Ukraine alongside the blue with gold stars of Europe. In order to make sense of one aspect of the story, I went back to the moment when the protests started on 21 November 2013, which was when a treaty with the European Union was rejected. It is the “Deep and Comprehensive Free Trade Agreement“, negotiated over many years of conferences and drafts. What was in that treaty? I pulled up the original source, the treaty itself and the conferences that shaped it. They all talk at great length about establishing the “rule of law” in Ukraine. Those sources served as the Urquelle for one perspective that has to be illuminating, even from very far away. And, more to the point, it is one that has hardly ever been discussed in the mainstream media. Another story from Ukraine has been harder to trace down, but it shows how stories mutate like genetic modification – which is the bread and butter of this story quite literally. You may have read how the Ukrainian “coup”, now a year old, was a push by US corporate interests such as Monsanto to take over Ukrainian agriculture and put Genetically Modified (GMO) crops into Ukraine. I originally thought that this came from our friends at RT, formerly Russia Today, the main propaganda organ for the Putin regime. But that was only one step in the mutation of this story. The original piece apparently is from Consortium News and mentions, among other Western interests moving into Ukraine, a new non-GMO seed plant by Monsanto. Bits and pieces have been put together into a story that has taken on a life of its own over a full year. 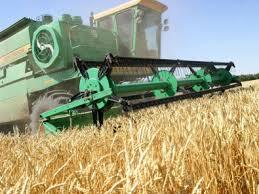 Threshing wheat in Ukraine. It’s still non-GMO by law to this day. Many big stories like this look very different from the original source. Before anyone jumps to conclusions, it’s best to see if there is an original source that backs up the claims of any given site on the ‘net. That has to start by determining if there are any primary sources in an article. If there aren’t, it’s probably not worth repeating. Stories like that often make their way back to the mainstream, too, so it’s not just blogs which you have to watch carefully. Another good example of stories that take on a life of their own are polls, a subset of scholarly work that might have many potential conclusions buried in a mountain of data. Many people like stories based on polls because they have the allure of hard, scientific fact. But the very least you have to expect is a link back to the original report on the data. A statement about how valid it is reported to be is also important, especially when a difference noted is within the margin of error. Without the original source, the validity of a poll cannot be verified and it should never be taken as some fact, despite the allure. We are all writers, of a sort. Good writers have long looked for primary sources. But in today’s internet world links are shared by readers on twitter and facebook, and are often further amplified in blogs. If you share a story without the Urquelle, you are contributing to the mud in the great river of information. What is the Urquelle to a reader, writer, or sharer on social media? It is nothing less than the cool, clear original source of information. It can be a scholarly article, an eyewitness account, or a big long treaty. It may be a mountain of data or a properly formatted chart that includes where it came from. In any case, the original source should be used whenever possible. Without that Urquelle there is little available for the seekers of truth to navigate on the rolling muddy waters of a big story flowing through the ‘net. This entry was posted in Nooze, Writing and tagged business, Economics, information, journalism, longreads, musings, News, Politics, propaganda, Russia, Ukraine, urquelle. Bookmark the permalink. There is so much crap on the internet. People just repeat each other and add their own opinion like its fact. Its like the old game of telephone except everyone deliberately has to distort the story as it goes. That’s a good way to look at it. I was thinking of tracing how the Monsanto / Ukraine story evolved, but I think it’s pretty obvious what happened here. People kept adding to it as it was repeated. Good stuff. It is worth seeing that again, yes. Thank you very much! 🙂 I want to encourage people to find these sources as much as possible to cut down on the dreck that gets attached to very important stories. Sensationalism and raw propaganda helps no one. You can’t believe anything you see on the net. I like how you do include original sources for your data but I would still advise everyone just use common sense when they read something. “…Now, THEREFORE, I, GERALD R. FORD, President of the United States, pursuant to the pardon power conferred upon me by Article II, Section 2, of the Constitution, have granted and by these presents do grant a full, free, and absolute pardon unto Richard Nixon for all offenses against the United States which he, Richard Nixon, has committed or may have committed or taken part in during the period from January 20, 1969 through August 9, 1974. I could not agree more that the weak ties and no price to pay for stupidity aspects of the Internet require that you read and source carefully. But this would seem to apply very well to your biased and silly analysis analysis. I am too lazy to put the links in but Victorian Nulands/George Soros’/and Barack Obama’s comments about our hand in this “coup” Are well-established. Can you really believe that the Democratic destiny of the Ukraine is what this is about when we are flush in this country with free speech and Constitution free Zones? Is the Putin regime an aggressor for drawing a line when it comes to the Ukraine after all the former Soviet satellites are now NATO members? Is he an aggressor for having The nerve to lead a country that has the temerity to be surrounded by our military bases and subject to our “grand chessboard strategy”? Zbigniew Brezinski’s treatise that belongs in the garbage heap of history — but is not – that demands Russia be sliced into five rump/impotent states? Here is an original source for you… Read the user reviews! 1) After Yanukovich fled, there were elections for President and the Rada (Parliament) within months. Are you alleging that these were not free and open and genuinely reflected the will of the people? Because no one, not even RT, has made that claim. And the installation of a properly elected government makes any claims of a “coup” one year ago moot. 2) There is no original source for these claims that it was a “coup”. There are many threads of it bubbling together, many of which do indeed come from RT. There are quotes from various people taken terribly out of context, and there is the famous hacked phone call from Estonian FM Paet that is often taken very much out of context where he repeats some rumors for the EU FM. But there is no original source for these claims, no. The answer is no, we have not. Despite signing the Bucharest Memorandum in 1994 when Ukraine gave up nuclear arms and we promised to protect their sovereignty, we have not marched into there. We have every justification for doing so, but have not. Do you allege that we installed a government in Ukraine and then, despite a treaty obligation, deliberately left them to their own devices? Lastly, the theft of credit card information from Target and many other places has been traced to the Ukrainian Bratva (mafia). No one has been rounded up for this, ever. If we have such a strong corporate influence in Ukraine, why have we not put a stop to this? Why have we not gone after the perpetrators? The only conclusion that makes sense is that our influence in Ukraine is minimal and that this talk of a “coup” falls utterly flat in how it has played out since in our actions and the subsequent elections. And the lack of a genuine original source shows where the problem is in this case. A man shaped by his background and culture to despise Russians? A private individual, speaking for himself only, as I’m sure RAND is as well? This is all a coincidence? He’s not a member of the trilateral commission and the Bilderbergs? Obama did not disappear under mysterious circumstances to meet with his overlords compatriots? No he just went out for coffee and didn’t want to tell anyone! No such thing as powerbrokers or kingmakers. We had nuclear weapons in Turkey that threatened the Soviets and the world was not brought to the brink of World War III. But after numerous attempts to kill Castro, when the Cubans in retaliation installed Soviet missiles near our border all bets were off. JFK woke up after that fiasco and here you are being an apologist for the same insanity that nearly burned the world back in 62. And I’m sorry to tell you that no matter how much sucking up you do you are not getting a job at the New York Times. Your pleas to recognize your blog as the greatest thing the world has ever seen, no doubt for telling people what they want hear, is pathetic. Talk about propaganda, buying it and disseminating it! Putin asked recently, after the fall of the Berlin wall, and since, where is our peace treaty? The Russians have been invaded many times throughout history, they took the hits in WW2 and we have absolutely no business meddling in their backyard, particularly when our own democracy is in a downward spiral to God knows where. It must be under this desk somewhere, along with truth, justice and the American way. I understand that you want to take on the US War Machine. Just don’t let yourself become a useful tool of the Russian War Machine in the process is all I ask. Have we done horrible things in the past? For capricious and unthinking reasons? Have we caused incredible suffering for picayunish reasons that actually harm our overall standing? Yes to all of that. But you can’t pin Ukraine on us, no matter how hard RT tries. And your rant that includes a hilariously off-point personal attack only proves the point that I have been making all along – there is nothing there aside from Russian propaganda. I still see this primarily as a battle between two organized crime units, one based in Moscow and the other in Kiev, for control. And the good people who risked their lives in Maidan are in the crossfire between these gangs. I think you did a far better job of proving my point that this has become conflated with a lot of nonsense far better than I ever could. And I thank you for that. But please, think first about the good people of Ukraine and what they have to deal with first. If it’s not about people and their aspirations for a better life then there’s no point to any politics anywhere.